2019 Yamaha Snoscoot ES CONQUER SNOW The small and nimble Snoscoot ES is a game changer, opening the door for new riders to discover winter. Powered by a reliable 192cc Yamaha 4-stroke engine, now with electric start, the Snoscoot ES is designed to ride on hard-pack and in powder snow with balance and flotation similar to full sized snowmobiles but with far less weight and complexity. YAMAHA 192CC ELECTRIC START 4-STROKE ENGINE The dependable Yamaha fan-cooled motor has been engineered for the SnoScoot using a high volume carburetor, diaphragm fuel pump and special cam shaft. Beyond bullet proof reliability -convenient electric starting and quiet operation are also important features for young riders. A back-up recoil manual starter is included for greater security. COBRA TRACK The SnoScoot has ample traction and flotation thanks to its 93 x 10 x 1.0 inch lugged Cobra track. This new track affords a great balance between hard pack agility and fresh snow ability. HAND WARMERS Parents all know that cold hands can cut a kid's day short. The 2019 SnoScoot features standard heated grips to extend the fun. Features may include: PERFORMANCE High Output Magneto Yamaha made sure there is plenty of electrical power in the SnoScoot for its bright 'trail legal' lighting system, toasty hand warmers and select options like a convenient electric starter. CVT Drive System The SnoScoot's performance benefits from a direct drive, CVT with plenty of gear ratio supplied through a durable rubber drive belt and variable pulley transmission. 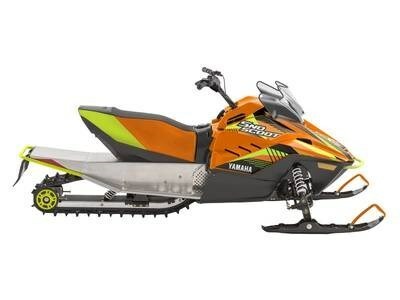 HANDLING Wishbone front Suspension Double wishbone front suspension serves up 4.5 inches of travel with a 30.5 inch ski stance giving the SnoScoot plenty of stability and ride comfort. COMFORT Trail Certified Headlight A bright 55/65 watt bulb, lights up the way to make sure the SnoScoot rider can see and be seen. Meeting the international compliance specifications for public trail use.